Augustus Goertz was born and raised in an artistic/ bohemian household in Greenwich Village, New York City. He received his education at La Guardia High School in NYC, at Carnegie Mellon University in Pittsburgh, PA and eventually earned a BFA from the San Francisco Art Institute in San Francisco, CA, where he studied with Bruce Nauman, Jay Defeo and Wally Hedrick. Upon his return to New York City in the 70’s, he settled in the formerly artistic and intellectual environment of Soho, New York City, where he started exhibiting and soon joined Sarah Rentschler Gallery with a roster of- at that time- emerging artists of whom many are now well known, established artists such as John Ahearn, Stanley Boxer, Koki Doktori, Ronny Landfield, Peter Reginato and Billy Sullivan. From SoHo, he moved to TriBeCa, which, for many artists, had become a cultural refuge within a demographic desert. Upon the closing of Sarah Rentschler Gallery with its branches in New York City (SoHo), Bridgehampton and Watermill, Long Island, New York in the early 90’s, he found himself exhibiting in different places such as at Patricia Correia Gallery, Los Angeles, CA, Rene Fotouhi Gallery, South Hampton, Long Island, New York and Robin Rice Gallery, New York City, while staying close to New York City. 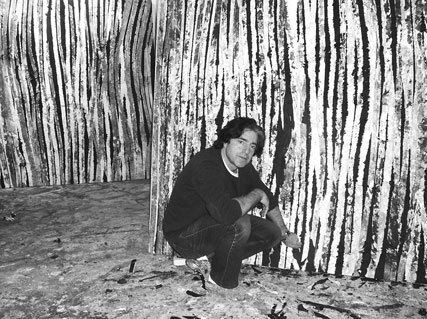 In the mid 1990’s, he joined Kim Foster gallery, originally founded in SoHo, but later relocating to the Chelsea district of New York City, where his work has been shown in many solo and group exhibition in the past. In the early 2000, Augustus Goertz started extensively exhibiting abroad, especially in Germany and Austria, where he had many commercial and institutional exhibitions. In 2011, he begun exhibiting (with Able Fine Art) in South Korea, where he had several exhibitions to date. Augustus Goertz, is now managed by LichtundFire and continues to exhibit in the US and abroad, most recently in Seoul, South Korea. His main artistic focus, while still working on other topics and in other media, is currently the End of War series- an ongoing series of semi-abstract mixed media paintings, depicting the human struggle with the atrocities of war and our perpetual willing and unwilling participation in it. He remains a resident of New York City, personally deeply rooted in its cultural environment and strongly inspired by its social fabric. His compositions reflect the human condition, subjected to seemingly forever changing parameters as well as to irrevocable, inherent repetitions within the flux of time. His work has been included in many national and international collections and has been sold at auction, most recently at Phillips, New York.